I came across this interesting piece on penalties involving ball markers on the web site better-golf-by-putting-better.com. I am indebted to Neville Walker of Perth, Australia, for permitting me to use it in full. “Dumbest rule ever invented.” Jesper Parnevik at the 2002 Genuity Championship at Doral. Professional golfers are no different to their amateur counterparts when it comes to playing by the rules. They too make mistakes, either through ignorance or oversight. The biggest difference is that professional golfers play under the spotlight of spectators, and this serves to highlight their mistakes. If a mistake goes unnoticed at the time of play, television viewers eagerly telephone in to act as armchair rules officials. An infringement is sometimes discovered after the player has signed his or her card, and he or she is disqualified for signing for an incorrect score. Marking a ball on the green is a simple act, yet it is not without its dangers. You may remember the incident that resulted in the above quote. Jesper Parnevik thinking he may have broken a rule called for an immediate ruling. What happened was that his caddie tossed him the ball which he fumbled and dropped. Unfortunately the ball landed on his coin and it flipped over. Did this incur a penalty or was he entitled to replace his ball marker on the original spot without penalty? Under the rules there is no penalty provided the movement of the ball or marker is directly attributable to the specific act of marking the position of, or lifting, your ball. Otherwise, you incur a penalty of one stroke. Unfortunately for Parnevik fumbling a catch could not be construed as marking his ball. Not even the professionals get it right. Recently on the Japanese tour an Australian golfer replaced his ball and before he could lift his ball marker, a gust of wind moved the ball to a new position. The player incorrectly replaced his ball and putted out. Consequently, he was penalised two-shots for putting from a wrong place (Decision 18-1/12). This is because it is irrelevant if a player has removed his or her marker before the wind moved the ball, as the ball is in play as soon as it is replaced. You may ask what Henry V’s speech to his troops before the Battle of Agincourt in 1415 has to do with marking your ball on the putting green. The key is in the words "Old men forget". Being a senior golfer, I have the excuse of age if I forget to replace my ball marker after being asked earlier to move it by a fellow competitor. Younger professionals can't use the same excuse for their transgression. Tom Lehman as defending champion had a memory lapse during the second round of the British Open at Royal Troon in Scotland in 1997. At the second hole Vijay Singh asked him to move his ball marker as it was on his line. He then forgot to return his marker to the original place before putting. He only realised his mistake on the next tee. By then it was too late and he was penalised two shots (Rule 20-7c). Two years later Tom Lehman was again penalised for a transgression involving his ball marker in his match against the Italian golfer Emanuele Canonica. In this instance he was representing the United States in the Alfred Dunhill Cup at St Andrews. Mistakenly he picked up his marker after having been beaten on the 18th hole. However, in medal match play this is not allowed, and he received a one shot penalty. A similar incident of not replacing the ball marker happened forty years earlier, but with a different outcome. At the 1957 British Open at St Andrews Bobby Locke, then aged 39, marked his ball one putter-head off the line of his playing partner Bruce Crampton’s putt at the 72nd hole. When he came to putt, he forgot to replace his ball marker in its original spot and putted from the wrong place. The error was only picked up on newsreel film and reported to the Royal and Ancient officials after the trophy had been presented. As Bobby Locke had a three shot lead over Peter Thomson, the Championship committee after an eight-day delay concluded that he had gained no advantage. Citing the equity and spirit of the game, the Committee decided that he should not be disqualified. Had they thought otherwise they would have had to disqualify Locke as the rules at that time made no provision for a two-stroke penalty for playing from the wrong place. There are golfers who use a memory aid to remind them to replace their ball marker in its original spot. They do this by always having the same side facing up when they mark their ball. If they have to move their marker, they turn it upside down. Of course, you need a coin or flat disk of some sort to do this, and not one of those plastic markers with a spike. 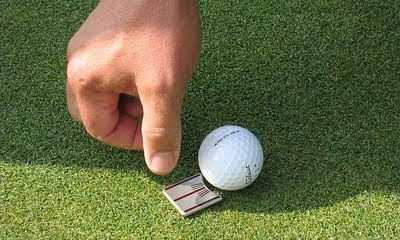 All of us know that to mark your ball, you first place your ball marker behind the ball and then lift the ball. What could be easier than that? However, a long day of competition can scramble the brain. We all have had mental melt downs at one time or the other. In my case they are euphemistically called senior moments. In a bizarre incident Ian Woosnam was penalised at the 1991 World Cup when he picked up his ball and forgot to mark it in his haste to get to a toilet. When he came to putt he looked for his non-existent ball marker which was unfortunately still in his pocket. Bernhard Langer, needing a par at the last hole to win the 1999 Greg Norman Holden Classic tournament at Lakes Golf Club in Sydney, Australia took a double bogey five to lose by one shot to Michael Long of New Zealand. There is nothing truly remarkable about that as many tournaments are lost or won at the death. However, in this case Bernhard Langer lost because of a simple mistake at the short 18th. He picked up his ball marker without first putting his ball down and by doing so he incurred a one stroke penalty. He describes it as the dumbest thing that he has ever done on the golf course. Golf is a game of rules. Some help us, other don’t. The best way to guard against unnecessary penalties is to learn the Rules of golf and carry a Rule book at all times in your golf bag. Hear, hear to that last sentence! No Rules - no improvement; know Rules - know improvement! what if...PLayer A repositions his ball away fr the line of putt of B. A then forgets to replace his ball but before he actually putts fr the wrong place. A realises his mistake and replaces the marker as close as possible to the original spot while a ball/marker is still on the green albeit on the wrong spot. does A incur a penalty for then playing from the spot where he thinks is the original position?? In these circumstances Player A has not incurred any penalty providing his fellow competitor(s), or opponent(s), agree that his ball has been put back on the original spot. Of course, the correct procedure is to reverse the exact method that the player used to mark the ball. In most cases this would mean putting the ball marker behind the ball, measuring the one or two club-lengths that was used previously, moving the marker to this place and then replacing the ball in front of the marker. I meant to say tht player A only realises his mistake while addressing the ball at the wrong place..then b4 he actually putts, he moves on to correct this mistake .. Yes, this is what I understood you meant to say. The fact that the player has addressed the ball in the wrong place does not matter. As soon as he marks and lifts his ball he cancels out the act of addressing the ball (worth remembering on a windy day). A player can mark and lift a ball as many times as he likes on the putting green and providing he then reverses his method of marking to the side so that the ball is back in the original spot before he putts it there is no penalty. In a singles stoke play (Played in lines of 3) if one player decides to play for fun is there a rule preventing this? So you would have 2 players competiting and one out for the day. There is no problem with the circumstances that you describe; it happens in Golf Club competitions all the time. The person who has not entered the competition may even mark the cards of the other players unless the Committee has directed otherwise. The situation would be the same if two players were playing a match against each other and a third person played with them, although this would be much more unusual. Does the ball have to be marked first before repositioning a putter clubhead from the original position? I often see golfers line their putter club head with the ball and place the marker behind the clubhead. No, part of Decision 20-1/16 states, "When moving a ball or ball-marker to the side to prevent it from interfering with another player's stance or stroke, the player may measure from the side of the ball or ball-marker. In order to accurately replace the ball on the spot from which it was lifted, the steps used to move the ball or ball-marker to the side should be reversed. So, it doesn't matter how you choose to mark the position of your ball providing you use the same procedure in reverse. The following situation happened at my club: player marked their ball on the green, replaced it (it was at rest) and then walked round to line up their putt, when the ball rolled down the slope (towards the hole). They then replaced the ball in its original position and holed out. I gave them a two shot penalty for playing from the wrong place. Please can you confirm that this is correct as one of them said she had spoken to someone else who says it is only a one shot penalty? As an aside, if they had replaced the ball in its original place and then realised that this was wrong before they had putted, are they then able to put the ball back in the correct place without penalty? Yes, your ruling imposing a two strokes penalty was correct. If before making their stroke from the wrong place the player realised that they must play the ball from where it came to rest, and they then replaced their ball at that spot, they would only incur a penalty of one stroke penalty under Rule 18-2a(i)for touching their ball in play. Barry, In a comp today I was on the green and near the flag on a par 3. Bacause there was a prize for the nearest the pin I measured thre distance to my marker....for some reason I then picked up my marker and put it in my pocket while I wrote down the measurement, when my partners got on the green we noticed my marker was missing, it was in my pocket with my ball....I called myself a two shot penalty although I had an exact measure to where the ball was origionally, was this correct? You incurred a penalty of one stroke (not two) under Rule 20-1 which requires that the position of a ball be marked before it is lifted, and contemplates that the ball-marker will remain in position until the ball is replaced. You must then place the ball as near as possible to its original position but not nearer the hole — Rule 20-3c. Barry, I saw the rule official on GC saying that it is ok to leave the ball marker behind the ball when putting. Is this correct? I try looking for the answer in the USGA rules and your website, but nothing mention about leaving the marker behind the ball during putting stroke. Please clearify. Thanks! This is a question that is regularly asked of Rules experts. There is nothing in the Rules that directly penalises a player from leaving his marker in place while putting. However, the question has to be asked as to why the player is doing this. If they forgot to remove their marker after lining their ball up then that is understandable. However, if they use this practice on a regular basis one might presume that they are doing so because they are using the marker to line up their putt, which would be a breach of Rule 8-2b. I suggest that the player who does this should be asked as to why they leave their marker in place and if they do not have a satisfactory answer the Committee should be informed. Just saw Ian Poulter get the same penalty in the Dubai year-end tournament at the last playoff hole. Fortunately, his opponent, Robert Karlsson made a short birdie putt that he made, making Poulter's long (now) par putt miss less painful. Still, ouch! Yes, I was listening to the play-off live on radio. Kudos to Ian Poulter for immediately penalising himself. Do you remember another incident concerning Ian Poulter on the putting green? Check out this blog entry of mine; http://tinyurl.com/3aa2kuo. If a ball to be replaced is placed other than on the spot from which it was lifted or moved and the error is not corrected as provided in Rule 20-6, the player incurs the general penalty, loss of hole in match play or two strokes in stroke play, for a breach of the applicable Rule. would his action not be breaking rule 16-1 . This is not to say that I condone his action! I see this quite frequently where players have marked their ball on the green and then in the process of replacing the ball, they will place the ball, ball rolls slightly, they replace the ball in attempt to steady the ball. Is the ball in play as soon as they release the ball? Are they incurring strokes every time they touch it? This kind of blends in with the comment I believe Janice wrote a while back where a player placed their ball and it rolled while they were in the process of measuring their putt. In that case what should the golfer have done to avoid a penalty stroke? The player is obliged to replace their ball where it was when they marked it. So, if it settles away from that place they must replace it again at the marker. There is no penalty for doing so. In fact, if they don't replace their ball where it was when they marked it they incur a penalty of two strokes in stroke play for playing from the wrong place. If a ball has been replaced in the correct place and it subsequently moves (usually due to wind or gradient) then the ball must be played from where it comes to rest, without penalty. This is true even if the ball-marker is still in place (Decision 20-4/1). If the ball moves in the act of lifting the marker (caused by their finger accidently touching the ball), do they need to replace their marker first before replacing the ball to it's original position. Or can they just replace the ball to as near to the original position as possible on the basis that they can't be certain where to replace their marker anyway. ...the ball or the ball-marker must be replaced. If the spot where the ball or ball-marker lay is not known, it must be placed as near as possible to where it lay but not nearer the hole (Rule 20-3c). The rule uses says the ball OR the ball marker must be replaced. In my example both the ball and marker have been moved (the marker into the players hand). Does the rule require that the marker is replaced AND THEN the ball replaced? The use of OR in the rule seems to suggest that replacing the ball only would be ok. Yes, if the ball and ball-marker are both accidentally moved during the marking or replacing process then either the ball or the ball-marker must be replaced as near as possible to where it lay. I heard if you mark your ball on the green then set up for your putt and everything set the ball and take away the marker but u decide to mark it again and move the ball is that a penalty? No, Rule 16-1b does not put any limit on the number of times that you may mark and lift your ball on the putting green. Of course you must not cause undue delay in play by doing so, Decision 16-1b/1 confirms. Zach Johnson was just penalized two strokes for not properly marking his ball. Can another player Jason Dufner his oponnent or his caddie remind him to mark it correctly or say something when he marked it wrong before he putts. Information on the Rules is not advice and anyone may (and should) stop a player from breaching a Rule. Duffner was quite correct in bringing Johnson's breach to his attention regarding the ball putted from the wrong place. Johnson correctly then added the penalty to his score before signing and returning his score card. If he had not done so he would have been disqualified for signing for a wrong score. playing a team event today. we were beaten by one shot. however the team that beat us in my opinion cheated. on the 18th green 3 of the 4 person team chipped near the hole one of them marked his ball. the 4th member then asked him to put his ball back on the green while he was chipping in. i think this is taking an unfair advantage. let me know please? Thanks for fielding my question Barry, Does a player incur a penalty if they remind a fellow competitor to return his mark after moving it from the line of his fellow competitor. Is this considered advice? No, information on the Rules is not advice (Definition of Advice). In fact, players are encouraged to stop fellow competitors from breaching the Rules. Hi Barry, what if someone places the ball back on the green and the ball moves to a specific place several times. You can't really tell if that's where the ball is supposed to be or if it is in the wrong place, so the player plays from there. Now, does the player get the benefit of doubt? If the player has tried to replace their ball at their marker, but cannot get it to rest there, they may place it at the nearest point to that spot, not nearer the hole, where it will stay at rest, without penalty. Thanks Barry, so if the ball keeps collecting to a specific spot, the ball can be played from there right? Or does the player have to place it at the spot? So can he place it where he thinks it should be and let it roll a bit to that spot and then play from there? The spot where the ball keeps settling in is not the spot where the player is trying to replace it. As I said in my previous reply, the player must then try to place the ball at the nearest point to where it was marked, not nearer the hole. If this is where the ball kept settling then that is the spot where it should be placed. However, if that spot was nearer the hole then it must not be placed there. Ok, but if the ball doesn't stay anywhere else other than the spot where it is collecting, then the player can play from there provided it is not closer to the hole, right? You seem to be having a problem understanding this. There has to be somewhere else on the golf course, other than the spot where it naturally rolls to, where the ball may be placed at rest. If the ball will not come to rest where it was marked the player must place it at the nearest point that is not closer to the hole. If this is the point that it naturally rolls to then that is the where it should be placed; if there is another point that is nearer then it is not. Hi Barry, what if a player realizes that he has broken a rule after the tournament has finished? If the competition result has not been officially announced the player is disqualified for returning a card that had a lower score than was actually scored, due to the omission of the penalty. However, once the result has been officially announced the Committee may not impose any penalty on a player for failing to include a penalty that they did not know they had incurred (Rule 34-1b). Ok, but what if the player knew that he was in breach of a rule, but didn't tell anyone? (iv) knew, before the competition closed, that he had been in breach of any other Rule for which the penalty is disqualification. In such circumstances. it would also be appropriate for the Committee to consider whether there should be other sanctions imposed on the player, such as suspension from competitions. Ok thanks Barry, one last situation, what if something happened to a player during one of the rounds and he was not sure if he was in breach of the rules or not. He didn't tell anyone, and after the competition has closed, he thinks he may be in breach of a rule. What does the player do? A player should not sign and return their score card if they or their marker have any doubt about a possible breach of the Rules. They should obtain a ruling from a Committee member before returning their card. If there is no Committee member present they should attach a note to their signed score card outlining all the facts of the situation. In your sitaution, the player had returned a score card knowing that a breach may have occurred, he should immediately inform the Committee, who should then disqualify him if they rule that a breach had been incurred, which was not included in the score for the hole. There is no time limit on the disqualification as the player was aware that a there was a possibility that he had incurred a penalty (Rule 34-1b(iii)). No, it does not, otherwise I would have said so! Hi Barry I'm a 7 handicap and just wanted to check a rule, what of anplayerbaces his ball on the on thé putting green just a little bit to the side of the real place of the ball, but it is not closer to the hole. What happens then? There is no penalty for marking your ball to the side, providing you replace it where it was when you marked it. If you forget, and replace it in front of the ball marker you are penalised two strokes for playing from the wrong place. Rule 20-7. In doubles match play if 1 member of the team marks his ball and then replaces it in the wrong spot and plays his shot, does the team lose the hole? No, only the player that putted from the wrong place is disqualified from the hole; their partner may continue play (Rule 30-3e). So if one player in a four ball team breaches a rule, its only him that is out of the hole right? The other partner can still play on right? A four-ball team competition is not a format that is recognised by the Rules of Golf. However, in the absence of any relevant Condition of Competition, only the player breaching a Rule relating to marking a ball is penalised, not the side. Be aware that there are some other Rules breaches that result in the side being disqualified, see Rule 31-7. Ok thanks Barry. So basically if one player breaches a general rule, (Touches sand in a bunker or moves loose impediments in a hazard) it only means that they are out of the hole and their partner can still play on. Am I correct? That is correct, providing their breach does not also assist the play of a partner (team member). Hi Barry, Just wanted to check a ruling. Say Lasers (Bushnell's) are not allowed for a club medal. Player A and B are playing together. Player B doesn't know that lasers are not allowed and so he uses it. Out of Kindness, player B tells player A the distances that he got through the laser. Player A did not ask for the distances. Player A knows that lasers are not allowed so player B is in breach of the rule. Since player A knows that player B will tell him the distances even though he doesn't ask for them, player A doesn't tell player B that he is breach of the rule. This is the situation I was faced with a couple of days ago. I hit my approach shot onto the green. I went to the green and saw that my ball was just in front of my ball mark. So, just for safety that the marker didn't move while I was repairing the ball mark, I moved my marker, repaired my ball mark, and then moved my marker back. I then placed my ball in front of the marker like I usually would, but I noticed that my ball was not right it front of the repaired pitch mark. In other words, when I was moving my marker back and forth, I must have not moved it at the same angle, and so the marker moved closer to the hole, and hence the ball was closer to the hole as well. So, i moved my marker back to where I estimated it was, and placed the ball in the estimated place that it was. Did I do the correct thing? I recommend that you check out my blog from 6th October 2009, entitled "Every Golfer is a Referee". In stroke play, competitors have a responsibility to all the other competitors in the competition to advise fellow competitors when they breach a Rule and make sure that the penalty incurred is included in their returned score. In my opinion, the Committee would be correct in disqualifying a player who not only did not inform a fellow competitor of a breach of the Rules (using the distance measuring device) but has personally benefited from information passed on to him that was obtained from its use. There is no penalty, provided the movement of the ball or ball-marker is directly attributable to the specific act of marking the position of or lifting the ball. Hi Barry, just a follow up on my previous question on lasers. What if player A doesn't tell player B his breach for 2 holes. Player A then tells player B that he is in breach on the third hole. So, player A has got an advantage for 2 holes. Does this mean disqualification for player A? My original answer stands; "In my opinion, the Committee would be correct in disqualifying a player who not only did not inform a fellow competitor of a breach of the Rules (using the distance measuring device) but has personally benefited from information passed on to him that was obtained from its use." It does not matter whether the player did not inform their fellow competitor of the breach on the 3rd hole, the 18th hole, or after the round; the Committee must decide whether they should be disqualified under Rule 33-7, with reference to Decision 33-7/9. Thanks Barry, so my playing partner would not have incurred any penalty right? Yes, that is correct, as above. Hi Barry, what is the definition of "Artificial device"? Is a towel considered an artificial device? There is no Definition of Artificial Device in the Rules of Golf. Manufacturers should submit to the USGA/R&A a sample of any item to be manufactured for a ruling as to whether its use during a stipulated round would cause a player to be in breach of Rule 14-3. A towel is not an artificial device; it is part of a player's equipment. However, Rule 14-3 states that equipment may not be used in an unusual manner. For example a towel may be used to dry the grip of a club, or even be wrapped around the grip while the player makes their stroke (Rule 14-3c), but there may be other occasions where the use of a towel may be ruled as being unusual, which would then incur a penalty. Ok thanks Barry. Just wanted to clarify one situation. I had used a towel to wipe the ball on the green. I then tossed it to the side. I made my putt and then went over to the towel and made a few practice strokes near the towel just to check my stroke path. Any mark placed by the player or with his knowledge to indicate the line must be removed before the stroke is made. This is A different issue from using equipment in an unusual manner, Rule 14-3. P.S. It is better if you address these types of queries to me by email, rather than using the blog comments section. Hi Barry, I had a query related to what 'Anonymous' posted on March 17th. So, if the ball keeps collecting to a specific place, the player can just LEAVE IT THERE AND PLAY FROM THERE, if that point is not closer to the hole, and if that point is the nearest point to the original point where the ball would stay. Is that right? A qualified yes. If the point that the ball naturally rolls to is the 'nearest point' to where they are trying to replace it at their ball-marker, then yes, they may play from there. But in the comment that you refer to, that point was a "couple of inches" away. In my experience, there was probably a place nearer to the spot where the ball should have been replaced, perhaps by placing it on the other side of the ball-marker, but not nearer the hole, than the direction in which it was rolling. Can you align yor ball without first pacing a marker. For example turn a line left or right? No. A player may not purposely touch their ball in play without marking it (Rule 18-2a(i). Hi Barry, Frank here. I had a question on doubt. So, say when someone is placing their ball back on the green, the ball moves half and inch. (He tries to place it on the original spot several times, but it keeps moving) That spot is not closer to the hole, so he is eligible to play from there, if there is no closer spot. Say he plays from half an inch away. (From the original spot) Now, he will never know if that was the nearest spot to the original spot, because he didn't try any other spot. Hi Barry, can a player move his marker a grip length away, to get out of someone elses line? Or can he only use his putterhead to move the marker? Part of the Note to Rule 20-1 states, "If the ball-marker interferes with the play, stance or stroke of another player, it should be placed one or more clubhead-lengths to one side." So, there is no penalty if a player moves their ball-marker a grip-length away, providing it is subsequently replaced at the correct place, but it is bad practice to do so and should be avoided. I think that in the circumstances that you describe it would be very harsh to penalise the player two strokes for playing from the wrong place. After having tried several times to replace their ball at the correct spot, in my opinion placing it half an inch away is not unreasonable, although very strictly the player should have tried placing it 1/4 inch away first. However, the player was obviously not trying to gain advantage and it would be a very zealous Rules official who would penalise them for an infringement. Hi Barry, was just reading some of the other queries, and saw a lot about the ball moving on the green! I had one based on that as well. What if a player's ball continuously collects to a spot. The player leaves it there and picks up his marker. He then remembers that he should have tried to replace his ball as close to the original spot as possible. So, he remarks it, and moves the ball a bit to the right of the marker. (Because that spot to the right, would have been closer to the original spot) The ball comes to rest there, and so he plays from there. Yes, providing the player does their best to replace their ball as near to where it was marked and lifted as they can. Of course, in these circumstances it would be advisable to inform the marker as to why the ball is being lifted and replaced at a different place. Ok thanks, but it isn't compulsory to inform the marker, right? Also, once the player picks up his marker, and then remarks it at the new spot, he may not know where 'exactly' the original spot was. So, he could just estimate right? And if in doubt, he should put it in a position where it is definitely isn't closer to the hole than his original spot right? So that he doesn't gain any advantage. It is not compulsory to inform the marker, although, as I said, it would be advisable to do so. Otherwise, you are right, in these circumstances the player must make their best estimate as to where their ball originally came to rest. And if the player is in doubt, he should place it further from the hole rather than closer to the hole right? The player must make their best effort to place their ball where it was originally at rest, not any further from the hole and not any nearer to the hole. Ok, I understand what you are saying but say a player and marker disagree on where the ball should be. Then, the ball should be placed where it is further from the hole right? So that no advantage is gained. That is a decision that the player and marker must make. If it were me, and I was sure that I was right about where my ball was at rest, I would place my ball there, as the Rules require, and then, if the marker refused to mark my card, I would explain my position to the Committee. By placing my ball further away from the hole than where I thought is should be placed I would then be playing from the wrong place. It seems that you made your best effort to determine the nearest place where you could place your ball at rest, which was as near as possible to where it had been marked. Therefore, you acted within the Rules. We are talking millimetres here and it would be a very pedantic person who would try and impose a penalty in this, or the situation described in the previous comment. Actually what happened was that I remarked the ball the second time to try to place it back on the original spot. But, when I moved the ball to put it back on the original spot, I just had this feeling that I had not moved it enough and it was frankly not in the spot I wanted it to be in. But, I had taken some time doing all this, so I didn't want to remark the ball again and take even more time. Now, the thing is that there is no proof that I didn't play from the orignal spot, there is just that 'feeling' of mine that tells me I didn't play from the original spot. Sorry if this sounds weird. Do you understand what I mean? I completely understand what you are saying and refer you to my previous answer. However, if you feel that you should have penalised yourself then I am sure that no-one is going to argue with you. The only reason why I think I may not have breached a rule is that because when I first tried to place it on the original spot, it wouldn't come to rest. So, the fact that later I didn't place it on the original spot, I think, maybe ok since it probably wouldn't have come to rest there anyway, as it wasn't coming to rest previously. The only thing is that later, I didn't 'intentionally' place it at the nearest spot. (I didn't know the correct procedure then) I placed it at a spot between the original spot and the spot it was collecting too. When I think back to that incident, I think that the spot where I eventually placed the ball was quite close to the original spot, but I don't know if that was the 'closest'spot. Im not sure what I should do now. Any help will be appreciated. What more can I say? If you won a prize, then give it back and salve your conscience. If you took money off your fellow competitors then pay them back! If neither are relevant then forget the incident; you are probably the only one worrying about it. I cannot help any more. But can someone be penalized without definitive proof? Could you please clarify that if someone doesn't go through the correct procedure but it turns out that the end result was not a breach, is he still penalized for going through the wrong procedure? The answer to your first question is, Yes, a Committee's decision is final (even if it is wrong!). The answer to your second question is , No. When did the rule regarding ball-markers change stop. I recall that in the 1970s what is now the recommendation in the notice to rule 20-1 was a compulsory definition. I also seem to remember that there was a specific exclusion from using playing equipment (clubs, tees etc) to mark a ball. In 1978 when I was playing in a provincial amateur championship my opponent claimed the whole (which I was certain to win otherwise) when I marked my bowl with a tee. I was incensed, but we checked it with the rules committee afterwards and he was correct. I did check out the Rules for 1976 using the search term "ball markers" and found that it was the same as it is now. However, there was a change from the 1972 Rules. Thanks Barry. I will look at the rules history website. Sorry about the typos in my query. I use voice recognition and I didn't check it before I sent it to you. Hi Barry, today when I lifted my ball, i think i may have brushed my marker and moved it slightly behind. I didn't know exactly how much it moved, so I left it at the new spot and played. What happens here? Cause if had moved it forward again, and it turned out that I moved it too far forward, then i would have played from closer to the hole. The movement was only about a cm. If you moved your ball-marker while you were in the act of marking your ball there is no penalty and you replace the ball marker where you think that it should be to accurately mark where your ball was at rest before it was lifted. Because you think that you moved your marker (a centimetre) and did not then replace it where it should have been, you incurred a penalty of two strokes in stroke play of playing your ball from the wrong place. What you should probably have done in this circumstance is to say to your fellow competitors that you think that you moved your ball-marker forward fractionally and that you were moving it back a centimetre, as that is your best estimate of where it was. No penalty! Thanks for all your wonderful blogs - most informative. I have difficulty lining up putts and my golf pro has suggested that I put a black line round the circumference of my golf balls and use a large ball marker (similar to a poker chip) with a black felt tip line running through the diameter of the ball marker (similar idea to using the align aid shown in the photo). The method is simple - I place the ball marker behind the ball to mark the position of the ball, ensuring that the black line on the ball marker also points along the line of the putt. I then lift the ball, step back to double check my line of play using the black line on the ball marker (if necessary rotating the ball marker) then ensure that the line of the ball and the line of the ball marker are aligned. I then lift the ball marker and play my shot. I intent to use this for practice rounds but would this method of alignment be permitted during a competitive round of golf? I know that I can use a line marked on a golf ball to indicate my line of play. My golf pro has referred me to decision 8-2a/2 - Object Placed Beside or Behind Ball to Indicate Line of Play. This suggests that this practice would be OK provided that the ball marker is removed before making the stroke but I still have a niggling doubt as to whether the line of the ball marker could be construed as a training aid – in which case its use during a competitive round of golf would be illegal. Could I use the ball marker shown in your photo to align my putts? What about some of the LPGA golfers who seem to indicate their line of putt with a tee pointing along their line of putt? As you can see I am confused as to what is, and what is not, allowed to be used to assist in the alignment of my putts. 1.Do not align your ball unless the ball-marker is in place, or you will be penalised one stroke. 2. Do not align your ball-marker unless the ball is in place, or you will be penalised one stroke. So, the bracketed part of this sentence from you question is not permitted, "I then lift the ball, step back to double check my line of play using the black line on the ball marker, (if necessary rotating the ball marker)"
3. Lift the ball-marker before you make your stroke. 4. Do not unduly delay play. Hi Barry I'm a little confused as to ball moving on green and having to play it from where it lies and yet you say you can keep replacing it if it moves after placing it on green. Would I be correct in saying then, that if the ball marker is still in position and ball moves then you are able to keep replacing the ball in front of it (even if you have left ball and marker in position for several seconds or more), but if you have lifted the marker and the ball then subsequently moves of it's own accord before address, you have to play it as it lies even if it rolls into a hazard. What if it rolls nearer the hole or into the hole at this point? No, what you say is incorrect. Let me try and clarify. If there is a ball-marker marking the position of your ball on the putting green you may touch the ball to lift it, clean it, rotate it, etc. While you are touching the ball it is out of play. However, when you replace the ball at the ball-marker and it is at rest then it is in play, even though you may not have removed the ball-marker. So, if the wind moves the ball you must then play the ball from where it was moved to, even though the ball-marker still marks the previous position that it was at rest. The latter is true whether the ball moves further away or nearer to the hole. hi Barry, sorry, now i'm even more confused. I've read the replies above and when people say the ball keeps collecting to a different position, you say they must try and place it at a point nearest to where it was first marked. With my reply you say the ball has to be played where it rolls to even though the marker is still in place. I cannot see the difference between the 2 situations. The ball is in play as soon as it is placed and released from the hand and in one breath you say it must be replaced if it moves and another it has to be played where it rolls to! The movement will always be due to gravity, wind, ground irregularities etc Could you also answer the queries about it moving nearer to the hole or into the hole. many Thanks. There are two different circumstances here; a) where a player cannot replace their ball at the spot where they lifted it from because it will not come to rest there, due to gravity or ground irregularities, and b) where a ball at rest is moved by an element (wind). a) If a ball will not stay at the point marked by the ball-marker, the player must repeatedly place the ball at the nearest place to where it was marked, not nearer the hole, until it comes to rest. This could be a few inches from where the ball-marker still marks the original spot from where it was lifted, because a ball that has been released from the hand may not come to rest at that point (imagine releasing a ball from the hand on a steep slope). Once the ball has been at rest (e.g. for a couple of seconds) and it subsequently moves the player must play it from where it rolls to. b) If a ball is at rest alongside the ball-marker and is then moved by an element (wind or water) the player must play the ball from where it rolls to. If the ball is blown into the hole by the wind the player is deemed to haveholed out with their previous stroke, even if they had marked, lifted and replaced their ball and the ball-marker was still in place. Decision 20-3d/1. Do you honestly think that it is possible to replace the ball at the EXACT same spot as to where you lifted it? I don't see how it is possible to replace it exactly every time. On the putting green, the ball must be placed as near as possible to the place where it lay but not in a hazard. No, there is nothing in the Rules of Golf that mentions "room for human error". However, the Rules do provide for the circumstance that you describe; read a) in my answer above dated 17th September. Barry, as to your reply on 26th September, are you basically saying that if a person doesnt intentionally place a ball in a place where he gains advantage, and is honestly trying to place the ball back to the original place, then he cannot be penalized? Obviously, in most cases where a player 'honestly' tries to replace their ball at the place where it was originally marked, no penalty will be incurred. However, mistakes happen, which could mean that a penalty is incurred. For example, a player may place their ball-marker at the side of their ball for some reason, but when they replace their ball they place it behind their ball-marker and play from there. Even though this was a 'honest mistake' by the player a penalty of two strokes would be incurred for playing from a wrong place. It is a question of fact as to whether a ball has been replaced at the correct place, or not. If a player is in any doubt they should seek approval from their marker before continuing and if they disagree, play a second ball under Rule 3-3, notifying the Committee before returning their signed score card. Alright thanks but it it is a matter of maybe half a centimeter, then it the player has no intention of gaining advantage, then it would be tough for a rules official to give a penalty right? This question isnt to do with ball markers, nut it is to do with the putting green. One of my regular playing buddies always puts the flag stick in front of his ball and at the angle of his line so that he can make his practice strokes at that angle. His claim is that he cannot see the flagstick when he putts since his head is down, and so he cannot be penalized. A mark must not be placed anywhere to indicate a line for putting. Hey Barry, I just wanted to check a rule about the putting green. What if a player when removing his marker from behind the ball, accidentally scrapes the surface of the green while picking the marker up? Is there a penalty? No there is no penalty for causing damage to a putting green and the player is not permitted to repair such damage if there is any possibility that it might assist them in their subsequent play of the hole (Rule 16-1c). However, the player should obviously repair any damage to the putting surface before they proceed to the next teeing ground. Thanks, I was infact referring to the rule about scraping the surface to test the surface. If the player accidentaly scrapes the surface, is it still regarded as he tested the surface? No, if the player accidentally scrapes the surface of a putting green they are not doing so to test the surface and so no penalty is incurred. Hey Barry, on the putting green, if a player, when removing his marker accidentally plucks a grain of grass out with his marker, is it a penalty? In this case the marker was behind the ball. In my opinion, the player did not incur a penalty in the situation that you describe, as they did not gain any potential advantage with respect to the position or lie of their ball, the area of their intended stance or swing, or their line of play. Decision 13-2/0.5, is the relevant ruling. No, it is no different on the putting green to anywhere else on the course. The Decision I have referred you to, which can be viewed on-line at the USGA or R&A web sites, clarifies that there is no penalty if the player did not gain any potential advantage with respect to the position or lie of their ball, the area of their intended stance or swing, or their line of play. Perhaps the most common example of this, which I have previously blogged on, is when a player knocks down a few leaves from an overhanging tree during a practice swing. In most cases there is no penalty if there are many leaves remaining in the intended swing area, as there is no significant improvement that would give the player any advantage. My question is - whose prerogative is it to decide whether a ball marker needs to be moved if it is interfering with someone's line? The player or the opponent in whose putting line the marker is placed? Can the player insist on moving the marker if he feels that the ball marker could assist his opponent in his putt? Can the opponent insist on the ball marker not being moved by insisting it does not interfere with his putt? Here how will it be decided that the opponent aims to benefit from the position of the marker as a putting alignment aid? Either the player who is going to putt or the player whose ball is marked may choose to have the ball-marker moved to the side. However, Decision 20-1/11 states that a player may not insist on a ball-marker being left where it is in view of the purposes of Rules 8-2b and 22-1. Can you please address this follow-up, 'off topic' question to me directly by email at; rules at barry rhodes dot com and I will give my answer by email. Hi Barry, today I used one of those old ball markers that stick in the ground. But, everytime I took it out, it made the grass stick up. So, it became like a spike mark behind the ball everytime. Am, I allowed to ground my putter which would result in me tapping down the spike mark? No, the Rules do not permit you to repair this type of damage to the putting green. Of course, you should tap down the grass that you have raised with the ball-marker after your putt for the benefit if those behind you. Perhaps you should acquire a flat ball-marker if this keeps happening. So I cannot ground my putter? Apologies, I missed the point that you were making. You are permitted to lightly ground your putter as part of your address; this would not be considered to be repairing the damage made when you lifted your ball-marker, providing you did not press down on the area behind your ball. Hi Barry, opponent marks his ball with a pitch mark repairer/tee or similar so it is sticking up on the green. He then removes his ball. I then putt and my ball either goes offline or is spun out from hole and strikes his marker causing my ball to stop or be deflected elsewhere. Are any penalties incurred by anybody ? No, there is no breach of Rule by either player in the circumstance that you describe. However, a note to Rule 20-1 recommends that the position of a ball to be lifted should be marked by placing a ball-marker, a small coin or other similar object immediately behind the ball. A player marks his ball on the green, lifts, cleans and replaces his ball having lined up his markings with the hole. He leaves his marker behind the ball whilst he takes two or three paces back to check his alignment. He returns to lift the ball again as he adjusts the alignment, still leaving his marker in place. When satisfied with the alignment of his ball, he removes his marker before making his stroke. 1) Is there any penalty for not marking the ball each time it is lifted as the ball would be 'in play' as soon as it is placed on the green? 2) Has the player infringed the rules by using his marker to assist in aligning his ball before making a stroke? There is no breach of Rule and therefore no penalty for either of the circumstances that you describe, which are common practices on the putting green. Hi Barry, Thank you for taking the time to share your knowledge. My question is this.. My friend marks his ball on the putting green, Then before making his stroke he replaces his ball(obviously mandatory) leaving his mark on the green. He then puts his divot repair too behind his existing mark AND the ball to line up his putt. He then lifts his mark, replaces it in the center of his divot repair tool(magnetic) that is laying behind the ball and the former position of the mark and then picks up the repair tool and mark to eventually putt. Is this a "legal" practice? Thank you sir! Hello Barry. I have a question on Rule 20-3. Recently I marked a ball on the green for an opponent and he said that the rules state that I, as the person who marked the ball, had to replace it on the green. The rule seems open to interpretation as it states that the ball must be replaced by any ONE of the following: the person who lifted the ball, the player OR the player's partner. It seems to me that rule is saying any of those three can replace it under any circumstances. How do you see it? Hi Barry, 3 players reach a green and none of them mark and the first player putts. As he putts he realises that his putt is likely to hit the ball belonging to one of the other players. Can he or any of the other players move to mark the stationary ball before the moving ball hits it. When another ball is in motion, a ball that might influence the movement of the ball in motion must not be lifted. A penalty of two strokes is incurred in stroke play by the player that moves the ball. If fellow competitors agree to leave a ball on the putting green because it may assist one of them they are both disqualified for agreeing to breach a Rule of Golf (Rule 1-3). I recommend that you check out my blog, titled, 'Using a Ball as a Backstop', which goes into more detail on this subject. It is dated 18th June 2012. Hi Barry is there a specific rule that you must mark a ball as close as possible behind it or may it be marked further back as long as its replaced in the original spot as it was lifted from ???? The position of a ball to be lifted should be marked by placing a ball-marker, a small coin or other similar object immediately behind the ball. The provision in the Note to Rule 20-1 is a recommendation of best practice, but there is no penalty for failing to act in accordance with the Note. So, providing the player replaces their ball exactly where it was lifted from there is no penalty for marking it slightly behind or to the side, but the further away they mark it the less likely it is that they can accurately replace it. Barry, great information. We had a situation in our golf match today where the ball was marked. The player walked up to pull the flag and walked behind the line of the putt to read it. When he went to replace his ball, he had realized that the ball marker got stuck to his golf spikes and fell off further away from his original mark. This was a first for everyone in the group. Under the ruling, would this player be allowed to place the ball mark back at the original position without penalty? Nobody had remembered exactly where the ball was marked, and we only had an approximate location, which is why we could not determine if a penalty would be incurred. Decision 20-1/5.5 rules that the player incurs a penalty of one stroke and the ball must be replaced as near as possible to its original position but not nearer the hole. Recent situation at my club involved a player inadvertently lifting his ball marker on the green and whilst still bent down realising he had a stroke. He had used a plastic ball marker with a little peg on the back which digs into the green. The hole made by the peg on the back of the marker was clear and obvious to all of us on the green. Was he entitled to replace his marker in the hole made by the peg without penalty? The player incurred a penalty of one stroke for touching his ball in play, Rule 18-2a. It is irrelevant whether he knew exactly where it had previously been marked. In fact, he would have incurred the same penalty if he had touched his ball on the putting green without lifting it. Barry, many thanks for your response, but I suspect that I did not make the situation absolutely clear. The player had not replaced his ball, he simply lifted his ball marker before realising that he had a stroke. In effect, the position of the ball marker was itself "marked" by the clearly identifiable hole made by the peg on the back of the marker. In this situation, the exact position of the ball was still marked. PS my interest in the rules also stemmed from somewhat successful participation in the old inter-club Rules of Golf quiz and it is a great shame that the R&A has stopped running this event. I did understand the circumstance of your question. A player may not touch their ball in play without incurring a penalty. It did not matter that the position of the ball when it was lifted was precisely known. My interest in that Rules also began with the R&A inter-club quiz for Golf Clubs in UK and Ireland. I understand that they stopped the quiz when it became clear that each Club had a small number of 'experts' that participated in the quiz, but their knowledge was not being effectively spread around, so they chose to spend their budget in other ways. I have a terrible habit of following my putter with my eyes in the stroke. Would i incur a penalty if i left my ball marker in place during a putt in order to focus on the marker during the putt? Whilst there is no penalty for absent-mindedly leaving you ball-marker in position as you putt, it is a breach of Rule 8-2b if you purposely leave it there to give yourself any assistance in making your stroke. Must a player remove his marker before putting? If I replace my ball infront of my marker, take another read of my intended putt with the marker still behind the ball and the the ball moves. Is there any penalty ? Do I replace the ball back to my marker position ? A player may leave their ball-marker in place while they putt, providing they are not leaving it there to assist them in any way in making their stroke. So, if it is left there by accident, no penalty, but if they do so regularly they should be penalised. Best not to do it! Providing you, or another person did not cause the ball to move no penalty is incurred and the ball must be played from where it came to rest (i.e. not at the marker). My blog dated 21st January 2016 gives more information on this subject. I have only been trying to learn the actual rules of golf for the past year or so, but I am absolutely amazed by all the scenarios, questions and repeat questions that come up over something as common as marking a ball. However, I am now asking yet another question! If a ball marker is accidentally kicked or stepped on and moved by a player or their partner, it seems there would be a penalty (one stroke), pretty much the same as if they had touched their own ball. However, if another player or their partner accidentally moves the marker, is there a penalty, or do they simply move the marker back as close as possible to where it was originally? I will appreciate your comments on either scenario. I also very much appreciate all you do for all of us. You are correct in assuming that a player incurs a penalty for accidentally moving their ball-marker, that marks where their ball has to be replaced, unless it was while they were in the act of lifting or replacing their ball. Similarly, if a partner or either of their caddies moved it. However, there is no penalty if a fellow competitor accidentally moves it. In all cases the player must estimate where it is to be placed. Hi Barry. Having trouble finding any info on my query so can you help please. Was playing in an alternate shot pairs stableford competition. Opposing pair were a bit wound up and treating it like a match play before we even started, asking how many shots we had to give them. Anyway got that sorted out and off we go down the first. Partner thinned second shot through the green and I chipped up to leave her a 4 foot putt for par which she missed. I marked our ball which was about 18 inches from the hole. Opponents had played a lovely second shot in and she sunk the 3 foot putt for a birdie but she then picked up my ball marker and handed it to me!!! Had to remind her that we were playing Stableford...again!! I replaced the ball as close to where we thought it had been and made the putt. Should I have incurred a penalty for replacing the ball marker as I think she should have replaced it and did she incur any penalty? Weird!!! Neither side in this Stableford foursome incurred a penalty in the circumstance that you describe. Rule 18-4 is relevant; there is no penalty for a player touching a fellow competitor's ball, or their ball marker, which may be replaced by themself or the player. My friend marks his ball by dropping a coin on the green and then moving it behind the ball with his putter head then picks up his ball with putter head the ball never moves until the mark is in place. He reverses the procedure when replacing the ball.Is this a breach of the rules. No breach. The Rules do not specify how a ball must be marked, only that it is physically marked in a way that means that it can be accurately replaced. Barry just read your blog on US OPEN . Did you find the timing interesting of the announcement ? It was shortly after the line of sight ruling which we felt watching was a stretch -only a lofted wedge was getting to that ball and so the tower was not in play for that shot ? No, I see no link between the two Rules incidents. Check out the specimen Rule for TIOs in Appendix l, Part A of the Rules book. TIOs do not have to be "in play", a player may claim relief if one is on their line of play, whether or not they intend to play their stroke left, right or over it. I can assure you that all Rules officials on the course would be well instructed on the relief available on the holes that they were officiating and DJ was definitely given a correct ruling.